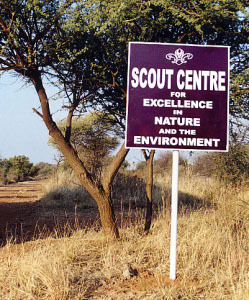 The SCENE is situated in the Mafikeng Game Reserve, 5km from the city of Mafikeng. Mafikeng (population 150 000) is the capital of the Northwest Province in South Africa, and is 320 km from Johannesburg, close to South Africa's northern border with Botswana. The SCENE is on the South Western edge of town. Take the Lichtenberg Road (the R52) out of town. Cross the bridge over the railway line and after 0.5km turn left into the Tourist Information Centre. It is a thatched brick building, with a thatched gateway. On the gateway you will see a sign for the SCENE. Pass the tourist office and drive round to the gate. At the gate turn right and follow the track into the game reserve to the SCENE. The nearest international airport is Johannesberg International Airport. It is approximately 4 hours drive to Mafikeng from there. South African Airways have daily flights between Johannesburg and Mafikeng (Mmabatho Airport, aviation code FAMM). Avis has a car rental office at the airport. Enquire at the SCENE, and we can help you get up-to-date timetable information. There is a daily bus service from Mmabatho to Park Station in Johannesburg. For timetable information call (Johannesburg) 011 333 4412 or Mmabatho 018 381 2680. A bus service also runs from Mafikeng to Pretoria via Zeerust and Swartruggens. Minibus taxis serve most destinations from Mafikeng. These arrive and depart from Station Road in Mafikeng. There are occasional passenger trains passing through Mafikeng.